As wintry showers continue in parts, snow is expected on high ground but could affect low-lying regions. 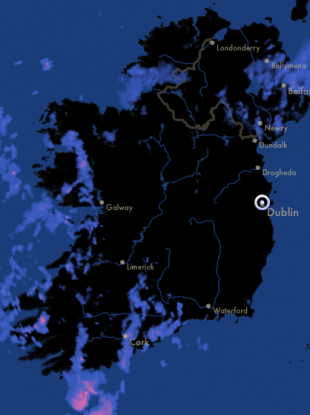 Rainfall over Ireland this morning. THE STORM THAT left thousands without power and caused severe flooding in many areas has mostly passed, and while heavy rain is expected today, no further flooding has yet been predicted. However, a Status Yellow warning remains in place. Snow was originally forecast, although hail is now expected, falling as sleet on higher ground. The AA has warned motorists to be wary of icy conditions on the roads due to low temperatures overnight. No further flooding has yet been reported, but excess surface water remains in places. Electricity has been restored to the vast majority of customers, with the ESB predicting that the over one hundred without power this morning will see service restored by this evening. Temperatures will plummet overnight to as low as minus two degrees. During the night, rain is expected to creep into the southwest yet again, with heavy rain forecast for Sunday with a chance of coastal flooding. Email “From floods to freezing: Weather turns bitter with temperatures set to drop”. Feedback on “From floods to freezing: Weather turns bitter with temperatures set to drop”.